Campus Explorer, a search engine to find information about colleges, and universities, has come into being to benefit students who face difficulties in visiting the campuses due to various reasons. 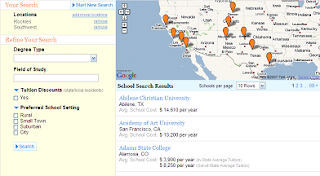 Now, you can search any information about colleges and universities in the US. Campus Explorer is still in beta stage and offering information on colleges and universities, filtered by region, area of study, type of degree, student population and several other search parameters. Search results are displayed on a Google map, and in a list format with links to the school’s profile on Campus Explorer. All required information, from fees to the admissions process is provided for users. It would be good to add the ability to save searches, or implement a comparison search as well. infotechone.blogspot.com is very informative. The article is very professionally written. I enjoy reading infotechone.blogspot.com every day.